Waiting times for the Q7, shown, are the longest of all Audi SUVs. 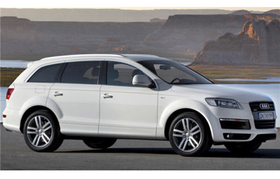 BERLIN -- Audi plans to add shifts to ease waiting times for models including the Q7 sport-utility vehicle. Audi plans additional weekend shifts this month at its two main German factories to increase production, CFO Axel Strotbek said. "The extra shifts are required by the good order book," Strotbek said in an interview on Monday. "The delivery times of several models are higher than we'd like." Demand for Audi vehicles fueled a surge in parent Volkswagen's first-quarter earnings before interest and taxes, which more than tripled to a record 2.91 billion euros ($4.3 billion). BMW AG, Daimler AG's Mercedes-Benz and Audi are targeting their highest-ever sales this year, lifted by growing wealth in China and a rebound in spending in the U.S.
BMW, the world's luxury-car leader, said in March that it may add production capacity in Brazil, even as it expands in China and India to keep pace with demand. CEO Norbert Reithofer said that handling the level of orders has been a "tour de force" for the production team. "Demand for luxury cars is being driven by China, the U.S. and Europe," said Daniel Schwarz, a Frankfurt-based analyst at Commerzbank AG. "Although we're at historical levels, it doesn't look like we've hit the peak yet." Audi sold 18 percent more cars and SUVs in the first quarter, a total of 312,600 units, and April deliveries confirm that the VW division is on track to achieve its full-year target of delivering more than 1.2 million vehicles, Strotbek said. "Demand in the SUV segment has accelerated sharply," the CFO said. "The Q7 has the longest waiting times, but the Q5 is also enjoying enormously high popularity."